Check out our review of the Samsung Galaxy S4 here. The Samsung Galaxy S4 comes with a quad-core 1.9Ghz processor and 2GB of RAM making it one of the most powerful smartphones available alongside the Sony Xperia Z and the newly launched HTC One. Storage comes in three forms: 16, 32 and 64GB whilst a micro SD card slot will let you expand that up to 64GB giving you a potentially huge 128GB of storage on an Android smartphone. All of this is then viewed through the 5-inch 1080p Full HD display which has been squeezed into a body that is smaller than the Galaxy S3 despite the larger screen and considerable bump in specs. On the back there's a 13MP camera capable of recording Full HD video and on the front there's a 720p 2MP camera for HD video calls. The S4 will also come running the latest version of Android Jelly Bean which means you'll get everything from Google Now to Photo Sphere along with the myriad of new features that Samsung have included themselves. Following months of rumours, the Samsung Galaxy S4 has now launched. The Samsung Galaxy S3 made a case for the Android operating system like no phone before it. It picked up the T3 Gadget Award for Best Smartphone of the Year 2012 and regularly tops lists of the best smartphones available on the market. Samsung has confirmed it is working on flexible displays and rumours are already circulating that the Korean giant is planning to utilise this technology for the Galaxy S4. Flexible displays are "foldable, rollable, wearable and more, [and] will allow for a high degree of durability through their use of a plastic substrate that is thinner, lighter and more flexible than conventional LCD technology," a Samsung spokesperson told the BBC. The flexible OLED (Organic Light Emitting Diode) screen on the Galaxy S4 would also likely be Full HD with a resolution of 1,920 x 1,080 or higher and would be a full five inches across - which is encroaching on Samsung Galaxy Note II territory. The leaked image was sent to SamMobile and came with a range of specs which suggest that Samsung will be launching a phone to take on both the current generation of the iPhone and also Apple's upcoming iPhone 6. We've not been short of Samsung Galaxy S4 spec rumours over the last couple of months. There are suggestions the Samsung Galaxy S4 will have 802.11ac WiFi technology – or 5G WiFiconnections. This is supposed to provide browsing speeds roughly equatable with a wired connection. Apparently, the Samsung Galaxy S4 will sport a Broadcom BCM4335 chip that incorporates the 802.11ac WiFi capacity along with Bluetooth 4.0 and an FM radio. According to Korean website Ddaily, the Samsung Galaxy S4 will arrive toting a quad-core Exynos processor built on the 28nm microarchitecture standard. Essentially, this is a smaller, faster Exynos (Samsung's own custom processors) than is currently tucked away inside the Samsung Galaxy S3. Newer processors, along with increased speed, focus on improving efficiency between cores. This should mean that the Samsung Galaxy S4 can boast more processes and a longer battery life than we've previously seen in a handheld. Other specs include a 13MP rear-facing camera and, of course, the aforementioned 1080p screen. In terms of browsing speed, a new rumour suggests the Samsung Galaxy S4 will arrive with 802.11ac WiFi - also known as 5G WiFi. This new WiFi technology is aimed at providing wireless speeds equatable with a standard wired connection. According to androidgeeks, the Samsung Galaxy S4 will arrive with a Broadcom BCM4335 chip that features 802.11ac WiFi, Bluetooth 4.0 and an FM radio. The Samsung Galaxy S4 may come armed with company's brand new Exynos Octa eight-core processor, if recent benchmarking tests are to be believed. It might sound a bit of a stretch but bear with us – model numbers SHV-E300S and GT-I9500, which have previously been mentioned as identifiers for the Galaxy S4 in previous speculation, have shown up in screenshots taken from the AnTuTu benchmarking app. The screenshots reveal a 1.8GHz processor, which is in line with the next-generation eight-core Exynos 5 Octa chip Samsung is known to be working on. As well as more power and speed, it is also thought to offer longer-lasting battery life. Some believe the phone will be more like the Galaxy Note 2 phablet, rather than the Galaxy S3. Golvin says other aspects of the phone will be debated until the launch event in New York on March 14, but he expects better battery performance and further display and camera improvements. Front facing speakers were also drawn out as possible features. Ramon Llamas, the lead mobile researcher at IDC says the Galaxy S4 launch will 'surprise and delight', but that it won't be down to the hardware improvements, claiming the specs race is all-but-over. 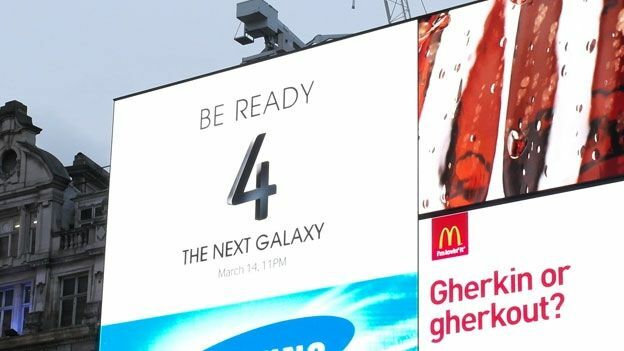 As stated above, Samsung has more or less slated the date for the Samsung Galaxy S3's launch as March 14th. Arumour reported to Sammobile from a "trusted insider" at Samsung pegs the Galaxy S4 release for March 15, 2013. Apparently, the handset will then go on sale in the second week of April, with Europe getting first dibs. We'll keep you updated with any new Galaxy S4 shaped rumours that come to pass. But in the meantime you can fill up your Samsung cravings with our Samsung Galaxy S3, Samsung Galaxy Mini and Samsung Galaxy Note 2 reviews.